40. Well earned drinks in 'The Old Tom' courtyard44. 'St Aldates Tavern'. 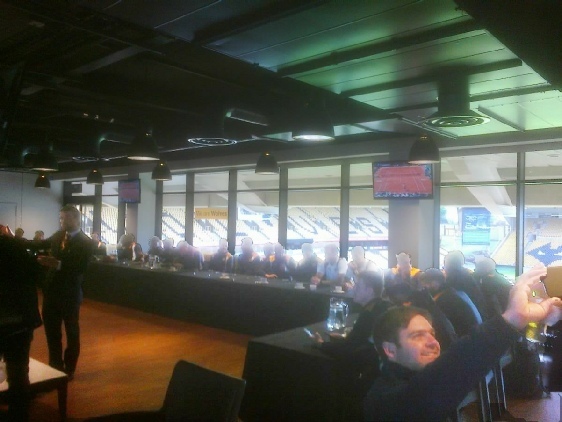 To celebrate our travelling membership, Wolves are inviting WWLSC members for a special lunch in the North Bank (WV1 restaurant) for the Leeds match. The numbers are restricted to 30 members because of other hospitality commitments so, if you would like to go, please put your name forward to Dave together with £30 each, which will be the cost of the meal to those members, thanks to WWFC's amazing generosity. Our special thanks to Matt Grayson, Wolves Head of Marketing, who has been strongly supportive of us over the years for arranging this with Roy. The £30 should be paid on booking immediately to Dave Slape and, in any case, no later than October 7th. We hope to be joined by representatives of that winning team from 1966, and look forward to a win against Leeds. Dave and Peter sponsor “Dangerous” Dave Edwards in celebration of London Wolves’ 50th Anniversary. This was the induction of Big Frank Munro, Andy Thommo Thompson Joint founder Jack Brodie, record-breaking goalscorer Dennis Westcott, during a ceremony at Molineux. Players: Bert Williams, Malcolm Finlayson, Derek Parkin, Bill Slater, Billy Wright, John McAlle, Jackery Jones, Ron Flowers, Mike Bailey, Kenny Hibbitt, Dave Wagstaffe, Jimmy Mullen, Johnny Hancocks, Billy Harrison, Roy Swinbourne, Peter Broadbent, Derek Dougan, John Richards, Andy Mutch, Steve Bull. Managers/owners: Stan Cullis, Graham Turner, Major Frank Buckley, Sir Jack Hayward. Teams: Victory over Honved, the 2003 play-off final team.